Home » Health » What Is Croup? 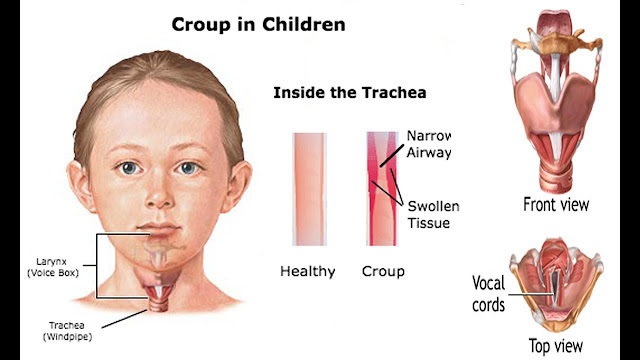 Croup is infection respiratory in children, which makes the airway obstructed. 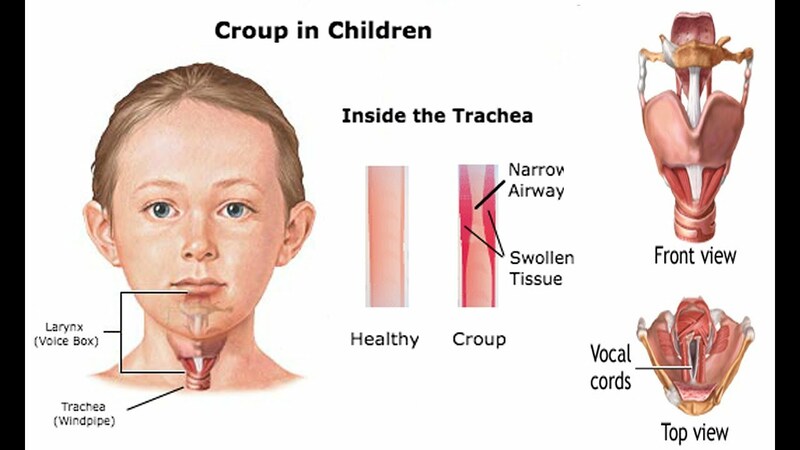 In croup patients, swelling of the larynx (respiratory tract after the throat, where the vocal cords are located), trachea (trachea), and bronchus (tracheal branch leading to the lungs). Croup can be contagious, especially in the first few days since the child is attacked by croup, or until the fever in the child disappears. When viewed from the cause, there are two types of croup, namely viral croup and spasmodic croup . There are several kinds of viruses that can cause croup, including adenovirus , respiratory syncytial virus (RSV), or measles virus. But generally croup is caused by parainfluenza virus. Children may be exposed to croup through inhaled air, if there is splash due to coughing or sneezing of an infected person. Viral croup can also infect a child through objects contaminated with saliva splashes, for example from touches on saliva-contaminated substances. The virus in the hand will enter the body, if the child touches his mouth or nose without washing hands first. This type of croup occurs suddenly, generally in the middle of the night. The child may awaken from shortness of breath, but not with fever. Spasmodic croup is caused by allergies or stomach acids that rise into the esophagus and respiratory tract. Although rare, croup can also be caused by bacterial infections or inhalation of chemicals that irritate the respiratory tract. Age . Croup generally affects children in the age range 3 months to 5 years. Gender . Boys are more at risk of croup than girls. Croup's symptoms are coughing like a bark. The cough usually worsens at night, and it gets worse if the child cries. A hoarse voice with a harsh breath sound can also appear. Other symptoms that occur depend on the type of croup experienced. Viral croupSymptoms in children with viral croup is fever and runny nose, accompanied by a cough. In many cases, this condition is caused by transmission from family members or friends who are coughing, cold, or having respiratory infections . However, viral croup symptoms are generally mild and do not cause interference with the respiratory system. Spasmodic croupChildren with spasmodic croup generally look okay, but a hoarse and harsh breath sounds occur in the middle of the night, and will improve if the child is brought to the open area with fresh air. Symptoms will generally improve within a few hours, but may show up for several nights in a row. There was a noise when breathing. Babies become more difficult to breastfeed. The child becomes restless or fussy. Croup symptoms generally last only 3-5 days. Immediately see a doctor if symptoms last more than a week or accompanied by high fever. A thorough examination will be conducted to determine if there is a bacterial infection or other serious condition. To diagnose croup, your doctor will ask you what symptoms are present, and whether these days are close to someone who is coughing or a cold . The doctor will also make observations on the child's breath, check the child's throat, and listen to the sound of breath in the chest using a stethoscope. If the symptoms of croup suffered are severe enough, the doctor will perform a check of X-rays to see the condition of the respiratory system. Most croup can be handled at home, especially in cases of croup that show only mild symptoms. Generally the symptoms of croup last for 3 to 5 days. Take note of the following to help with the recovery process. Make sure the child always feels comfortable and calm. Do not let your child cry, because it can aggravate the symptoms of croup. Give paracetamol if the child has a fever. Please consult your doctor before giving the drug to the child. Sit the child upright in the lap or in the toddler seat, so that children more easily breathe. Fulfill fluid intake by giving For older children, soup or cold fruit can help. Make sure the child rests more. Do not give cold cough medicine that is sold freely, because it will not help cure croup. Make sure you sleep near the child so that his condition is always monitored, and to be quick to take action if the symptoms worsen. If the symptoms of croup worsen or last more than 3 or 5 days, the doctor will prescribe a corticosteroid class of drugs such as dexamethasone , to relieve swelling in the airways. In severe cases, the child will be given extra oxygen. If croup is caused by a bacterial infection, the doctor will give antibiotics. Most cases of croup are caused by influenza-causing viruses, so the precautions are the same as preventing influenza. Things you can do include regular handwashing, avoid putting your hands to your mouth, avoid being sick, and teach your child to cover his mouth and nose with his elbows when sneezing or coughing to reduce the risk of transmission to others. Some cases of heavy croup can also be caused by measles virus. To avoid it, children can be vaccinated against measles. 0 Response to "What Is Croup?"